System Predefined Fields: These are view only system fields. You cannot edit or delete them. They are marked by yes (System) under Predefined column in Configuration Manager. Predefined Fields: These are view and edit only system fields. You cannot create new predefined fields or delete them. They are marked by yes under Predefined column in Configuration Manager. Custom Fields: You can add, view, edit, or delete these custom fields. They are marked by no under Predefined column in Configuration Manager. Ability to view the system predefined fields. You can view the system predefined fields in Configuration Manager, but cannot edit or delete them. Go to CRM > Fields. 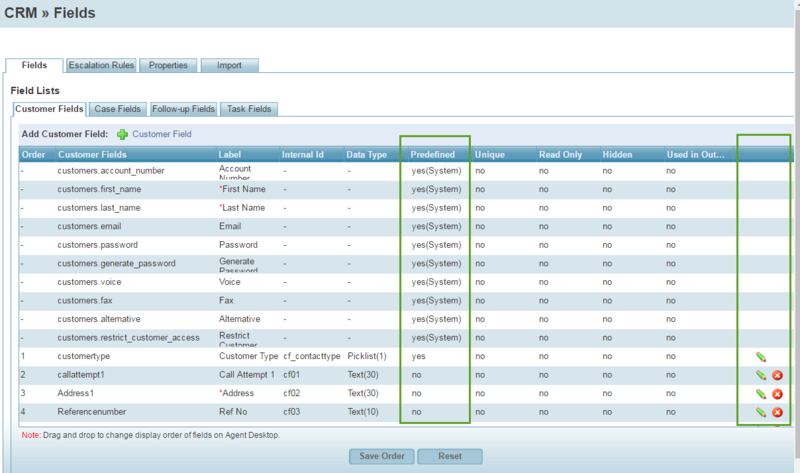 The system predefined fields are visible under all tabs: Customer Fields, Case Fields, Follow-up Fields, and Task Fields. Ability to mark a CRM field as mandatory. You can now define any existing or new predefined and custom field as mandatory. 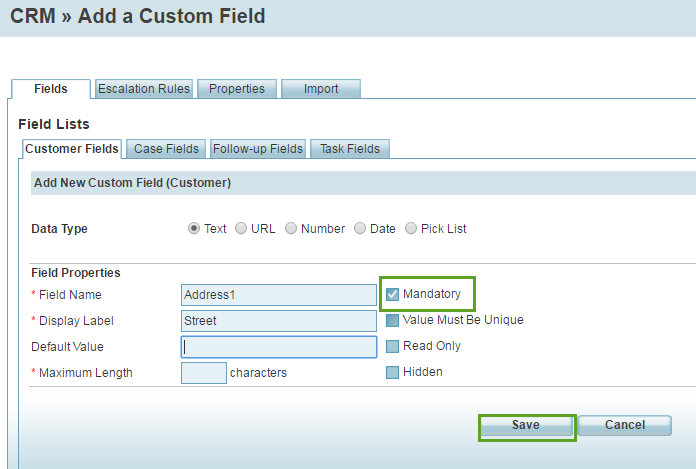 Mandatory fields can be added to Customer, Case, Task, and Follow-up objects. When creating new customer records or cases in Agent Console for example, agents must enter data into the mandatory fields such as Name, Email, or Address. Mandatory fields cannot remain blank. Note: System predefined fields are view only and cannot be edited. Click to add a custom field or to edit an existing field. Enter the field properties and maximum length if needed. In Agent Console, a red asterisk appears next to the mandatory field indicating a value must be added. You can now hide any existing or new predefined and custom field. 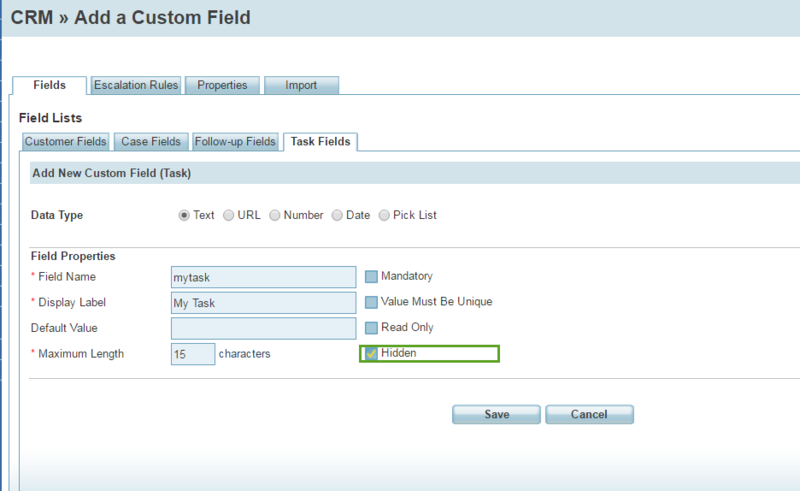 The hidden fields can be part of Customer, Case, Task, and Follow-up objects. Enter the field properties and maximum length. 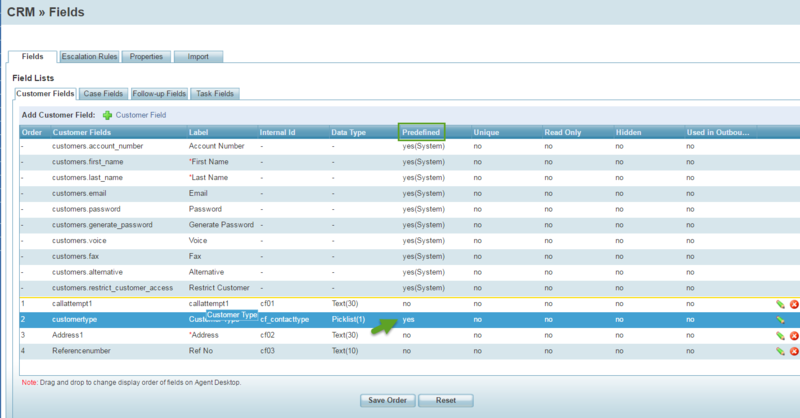 Ability to customize the display order of the CRM fields. You can now change the display order of CRM fields. 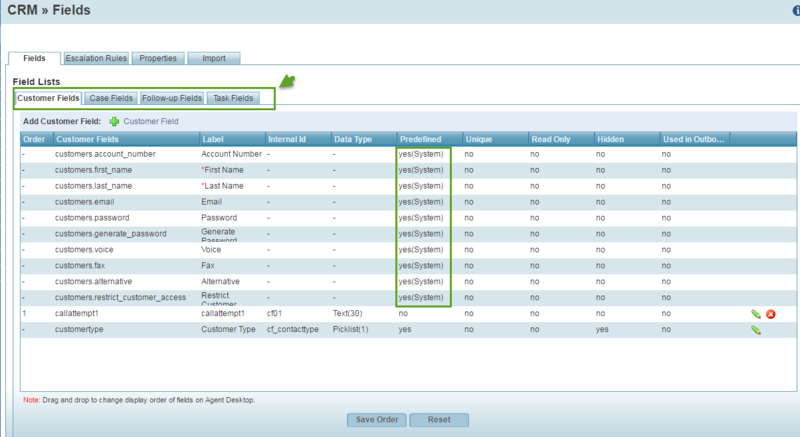 The CRM fields appear under Customer, Task, Case, and Follow-up objects in Agent Console. This feature is available to both custom and predefined fields. The system predefined fields cannot be moved. For example, in Customer Fields you can only move customertype which is a predefined field, in addition to the custom fields you have created.